On February 14, 2018, 19-year-old Nicolas Cruz walked into Marjory Stoneman Douglas High School in Parkland, Fla., and took the lives of 17 young men and women with an AR-15. In just the year since then, there have been over 300 mass shootings in the United States — and not one piece of common sense gun control legislation passed by Congress. As the brave Parkland survivors so succinctly and accurately put it: Enough is enough. In honor of the first anniversary of the Parkland shooting, Care2 will spend the month of February fighting for gun safety in the United States. Will you join us? Sign this petition, and help us get over 3,000,000 people working together to end gun violence throughout the month. In 2018, nearly 40,000 people died from gun injuries in the U.S. — the highest count in 50 years. It was also the country's worst year for school shootings, with 113 people being killed or injured in school shootings. There were shootings in bars, at birthday parties, at video game competitions, and in convenience stores. 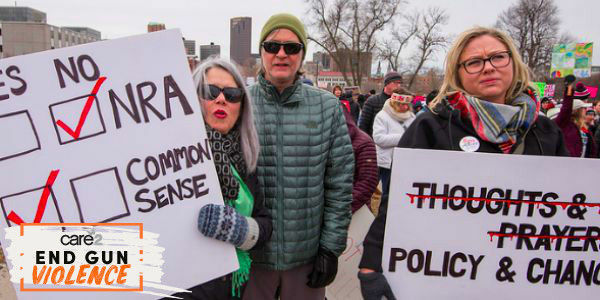 There were shootings targeted at known individuals, random acts of gun violence, and mass shootings designed to kill as many people as possible. Gun violence has become an epidemic in this country — so much so that these days the question isn't whether or not we will become the victim or survivor of a shooting, but when it will happen. And yet, despite 2018 being the deadliest year in recent history, our Republican-led Congress, whose pockets are padded by the NRA, refused to take action. But now, with Democrats in charge of the House, it's time for that to change. Please join us in our fight for American lives throughout the month of February. Sign the petition to help us end gun violence now. In loving memory of Alyssa Alhadeff, Scott Beigel, Martin Duque, Nicholas Dworet, Aaron Feis, Jaime Guttenberg, Chris Hixon, Luke Hoyer, Cara Loughran, Gina Montalto, Joaquin Oliver, Alaina Petty, Meadow Pollack, Helena Ramsay, Alex Schachter, Carmen Schentrup, Peter Wang.